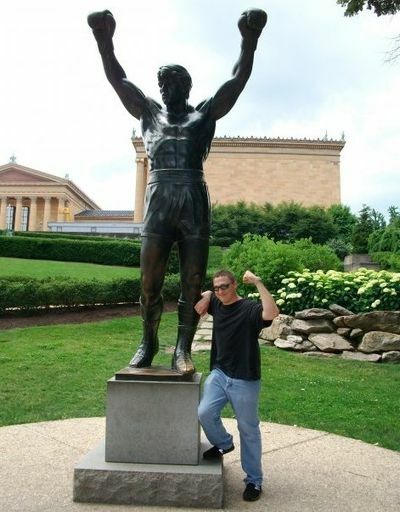 Ryan Kelly joins us tonight with a look at a Philly icon, done up in a small size. Tell us all about it, Ryan! Although Sylvester Stallone & crew probably should have stopped at Rocky II, I’m a big fan of all the films in the Rocky series (except 5, which I think most of us—Stallone included—try to blot out of our memories). 2006’s “Rocky Balboa” was able to ride the waves of nostalgia and actually be a pretty dang good movie, somewhat recapturing the raw and fresh underdog feeling of the first film in a way that none of the other sequels were able to do, and having a similar kind of realistic ending (unlike Rocky beating a 7 ft. steroid-inflated giant). In Rocky III, we were introduced to something besides Mr. T—the iconic Rocky statue (“Don’t give ‘at punk no statue, give him guts!!”). The statue still stands at the bottom and to the right of the famous museum steps (yeah, it’s not at the top any more), and tonight I’m reviewing a 12” version of it made by Schomberg Studios—the same people who created the original. Talk about nostalgia; this thing will give you a heavy dose of it if you’re a fan of the Italian Stallion. Nothing to get too excited about. Appearance is plain; black background with white text. The flap opens on top so you can pull out a huge block of foam (and I’m talking about the cheap messy kind). I hate foam, but I suppose it’s necessary to protect a statue like this. What wasn’t necessary was the tons of tape used to hold the two halves of the block together (which contain the statue in between them). I had to cut this tape loose with a razorblade to avoid damaging the foam (which you’ll need for whenever decide to put Rocky in storage). And little pieces were flaking off it the whole time, creating a mess. Despite my careful efforts, a small chunk of foam still came loose when I was trying to get the halves apart. To sum up, the box serves its purpose in storing and protecting the statue, but it doesn’t offer much else. Making it more collector-friendly and adding text and graphics to make it more aesthetically pleasing would have gone a long way. The appearance doesn’t even bother me; it’s just that God-awful cheap foam and the tape that makes it so difficult to get apart without tearing it up and making a mess. In fact, I’m now of a mind to take my score down from two and a half stars to two stars. There—did it. I’ll say up front that this category constitutes about 80% of the overall score, since accessories, articulation, outfit, and even paint aren’t factors here. 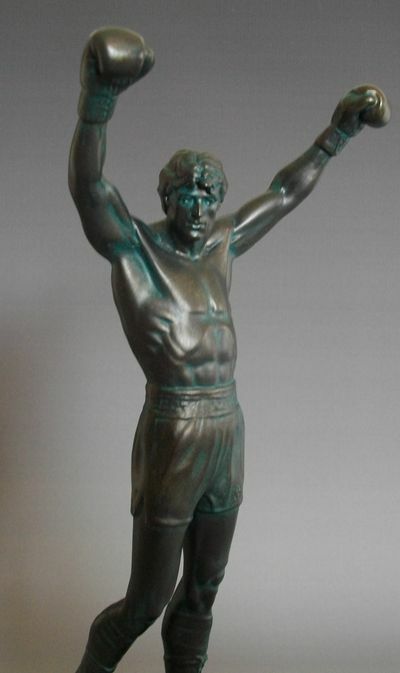 This can either be analyzed according to its likeness to Rocky/Stallone himself, or to the gigantic original, which I’ve included a picture of from my trip to Philly last summer for comparison (I guess having my picture taken with the statue, walking through the same places where Rocky ran in the first film, and running to the top of the Art Museum steps gave the ultimate nostalgic feeling). 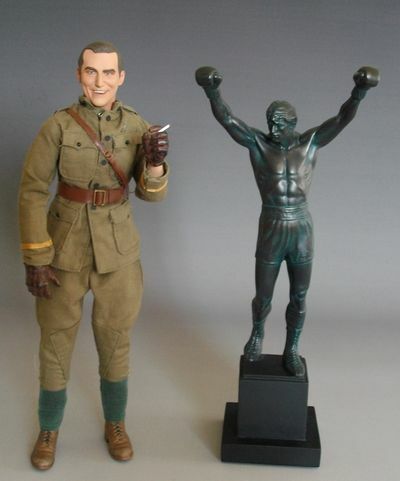 Bear in mind that the 12” goes from the tip of the gloves to the bottom of the base, so Rocky himself is significantly smaller than a 12” figure; I included a photo of it beside a Sideshow 12” figure to show the comparison (actually the figure is just a hair over twelve inches). 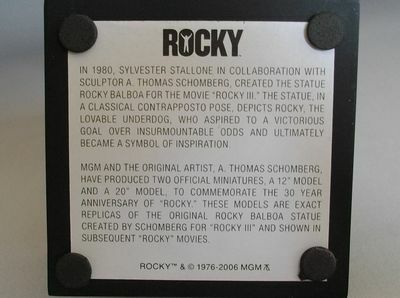 As far as likeness to Stallone himself, I suppose there’s really no difference between this and the 12’8” original. They both depict Rocky from Rocky III, where he’s lighter and more ripped than in the previous films. The face and hair, upon close inspection, are obviously Stallone. 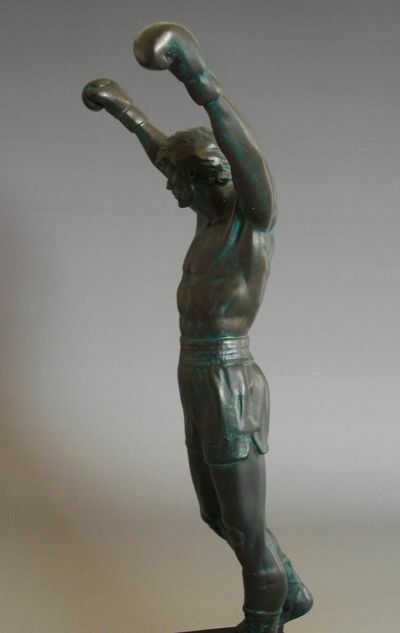 The arms and chest are perfectly carved and chiseled, and everything is well-proportioned. 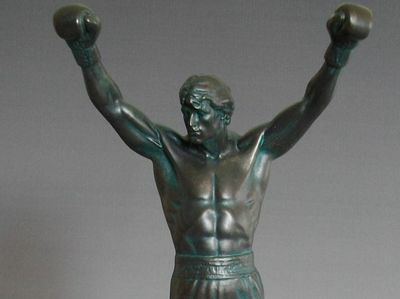 As far as likeness to the original statue—which is more important since this is meant to be a replica of the original regardless of the original’s likeness to Stallone—this falls short at a couple of points. 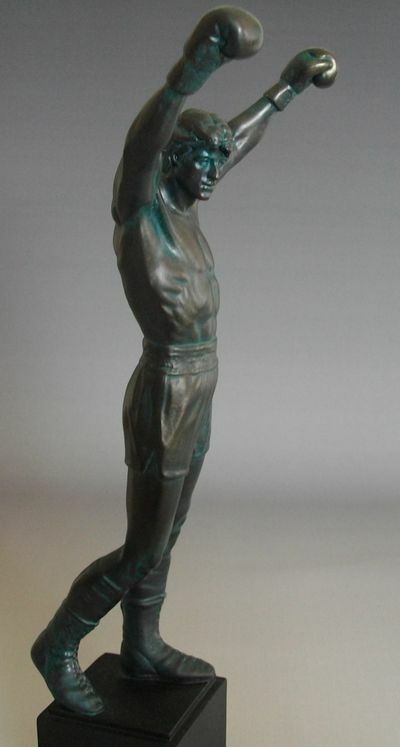 From the photo you can see that the chest on this statue is too narrow, the arms are just a bit too thin, and the gloves are slightly too small. 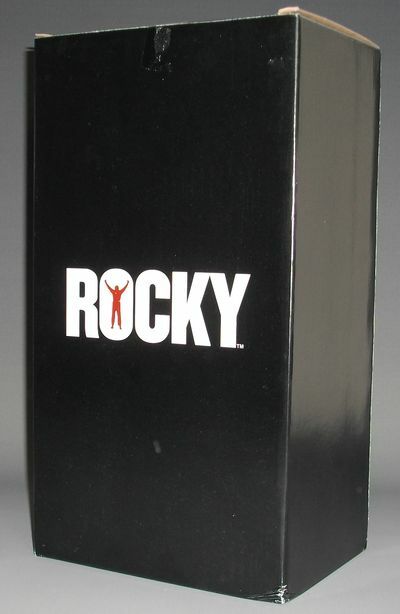 Yes, the original statue depicts a thinner Rocky, but with this 12” version he’s just a tad too thin proportionally. Buff him up just a tiny little bit and this would be a four-star sculpt. Sideshow currently has this statue on Backorder at $100. Their quantity is low, so I wouldn’t wait too long. Though it’s on backorder, they guarantee delivery within a couple of weeks. This is what I’m basing the retail score on, though some online retailers have it for more. Anyway, I know that this is polystone and polystone statues are expensive, but $100 is a bit too much for a statue this small in my opinion, especially considering it’s too thin within its own scale. However, if you compare it to the 20” version that is also currently being offered at Sideshow for a whopping $450, it starts to not seem so bad. There, you’re only getting eight inches more of statue for more than four times the price. 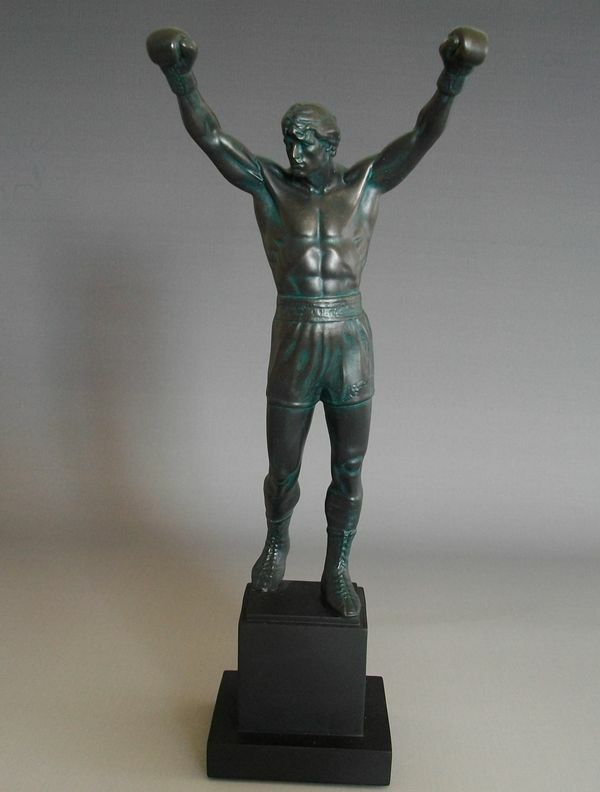 So if you decide you want a replica of the Rocky statue and you aren’t Donald Trump, this is probably the one to get. $100 is pretty steep, but if you’re a Rocky fan you probably won’t feel cheated. I got mine for $85 and free shipping from a kind ebay seller, and if you check periodically, you may find a similar deal, though I wouldn’t hold my breath. I haven’t seen any more of these on ebay except for one that was going on “Buy It Now” for about $200. If I hadn’t come across this one, I probably would have went ahead and bought it at Sideshow. $85 is obviously better than $100—especially with free shipping—and I think it scores another half star at that price point, making it about an average value. But, in my cheapskate mind, $50 would be ideal. Um…don’t drop it. That’s all I got. If I were scoring this based on how much I liked it, I would give it four stars and beyond. But looking at things from a logical standpoint, it doesn’t quite make the cut. The narrow chest and arms, the cheap, aggravating packaging and the high price are all enough to pull down the score by one star, at least for me. I suppose that if I graded in quarters like Jeff Parker I would give it three and a quarter stars, but I’ll stick with Michael’s scale. At my $85 personal value, it’s pretty dang close to three and a half stars, but only close. 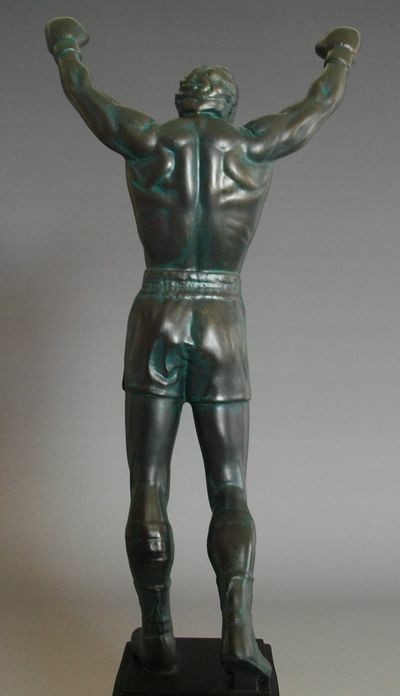 If you’re a big Rocky fan like me, however, you’ll love this statue regardless of the price, and will be willing to shell out any amount of cash within reason without feeling ripped off. This product was purchased for the review by the reviewer. Photos and text by Ryan Kelly.